Editing is a systematic process: finding flaws and fixing them. In step 1-3 of my Red Pen Editing cycle, I draw attention to the need to create distance from your writing, and to be in the right frame of mind, before you even think about picking up your red pen to start editing. I also suggest, at step 8 ‘Time to use the red pen!’, that you challenge yourself with the hardest editing fixes when you are at your best. For me, that’s the first thing in the morning. But what about when you are tired when the deadline is looming, and you must press on? Then what? 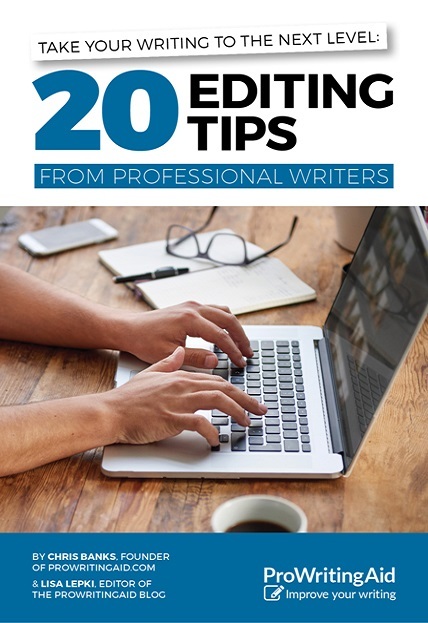 In today’s review of ProWritingAid, I’m focusing on how this software can take the tedium out of editing: how you can use it to achieve the best return on your time and energy. For a start, the software checks your words, and your sentences, and identifies all instances of rule breaking. You may know the rules, but spotting every single mistake can be like finding a needle in a haystack. Difficult when you are flagging? Your word processing software – Scrivener or Word or whatever – will have an option to check your spelling and grammar. That’s standard practice. At the simplest level, the ProWritingAid Grammar Check looks for spelling mistakes. Any word that is not in the dictionary is flagged as requiring either your confirmation that is indeed a correct spelling (and that you want to add it to the dictionary) or an edit to fix the problem. Alternative spellings are offered also – and you may need to look up the word in a dictionary to be sure which spelling is correct. But ProWritingAid goes further, highlighting grammatical rules you might have broken, and then explaining the rule so that you understand how you might edit the words to make them comply. This is part of a scene from The Ghost Writer, still in draft form and written in 2011 during NaNoWriMo. The blue underlining is for the one grammar issue found. Hovering near the word ‘full’ reveals a dialogue box explaining what rule might have been broken. Notice that I have the option to IGNORE the rule – for this instance – or to DISABLE THE RULE, which means such ‘errors’ will not be reported when I check the Grammar again. This is not recognised as a word and various alternatives are offered. I decided to delete the words ‘for today’s diarised entries’! Alternatives are offered including ‘handbook’ but I need to break it into two words: hard book. This term is not recognised, and I know it’s correct, so I choose the DISABLE option, which adds the word to the dictionary. IGNORE would ignore the word, but not learn it as a new word. For each issue, the mental agility required is minimal. I can stop at any time, and resume when I’m ready. There’s no need for ‘hard’ concentration. Gradually, the manuscript is cleaned, the underlinings are eliminated and I have a sense of achievement. Hooray! Isn’t that just the perfect way to spend the dying moments of an editing day that has been too long already? This is post 2 of my series looking at how ProWritingAid works with Scrivener. Why not join me on my journey as well? If you’d like to trial and work alongside me in exploring its features, click on any link on this page.